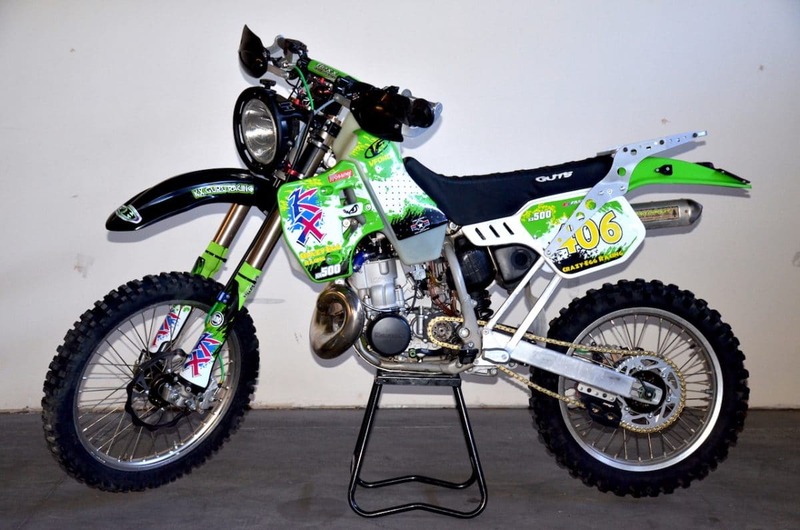 On this week’s Two-Stroke Tuesday we look at a street legal Kawasaki KX500 built by Alex Ward of KX Guru Racing for a cross country journey . 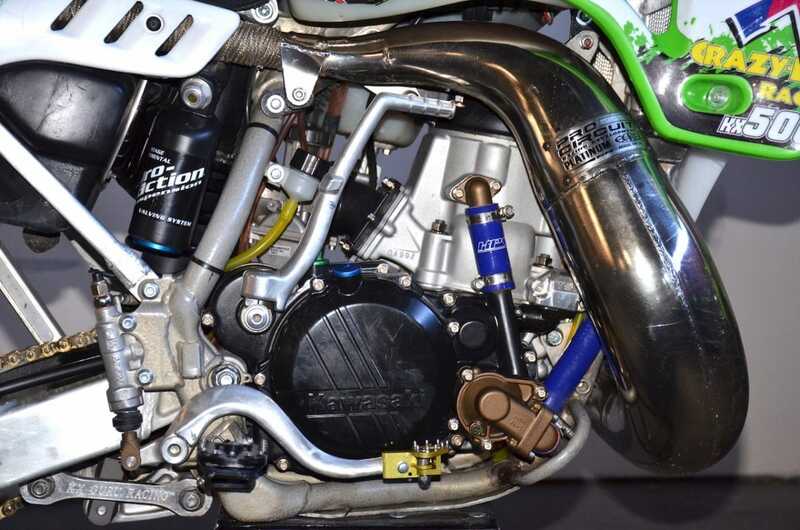 There are new items from Funnel Web Filters and Helix Products featured in 2-Stroke Hardware and don’t miss all the Kawasaki big-bore action in 2-Stroke Theater this week. Green machine premix faithful won’t want to miss the exclusive link at the bottom of this post to an insane KX500AF build! At first glance this might look like an average KX500 with some bolt-on upgrades that the average mechanic can perform. Nothing could be further from the truth! A high output ignition system by Powerdynomo, KX450 Fork upgrade, two piece clutch cover , special 5th gear and we are just getting started. 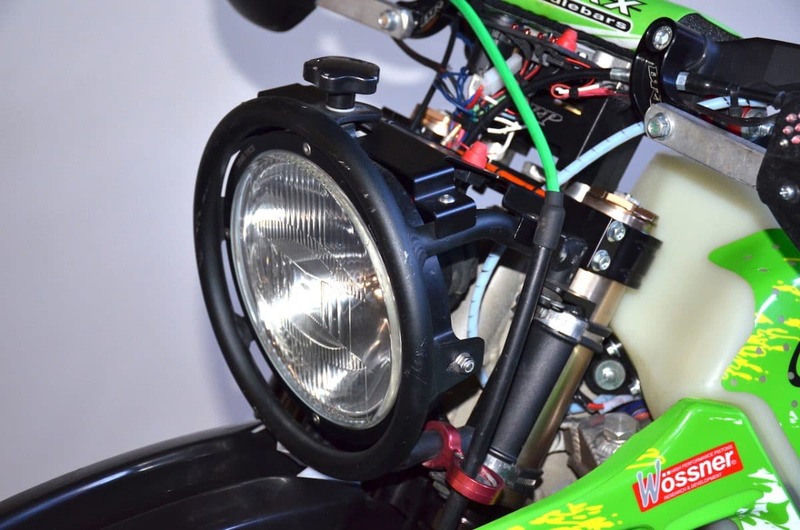 Up front Ward’s KX500 features a Trail Tech HID headlight, KX450 spring fork setup, DH-1 clamps, Fasst Company Flex Bars, Highway Dirt Bikes hand guards with built-in turn signals and a custom Kydex dashboard with idiot lights and topped of with a 12V charging port. 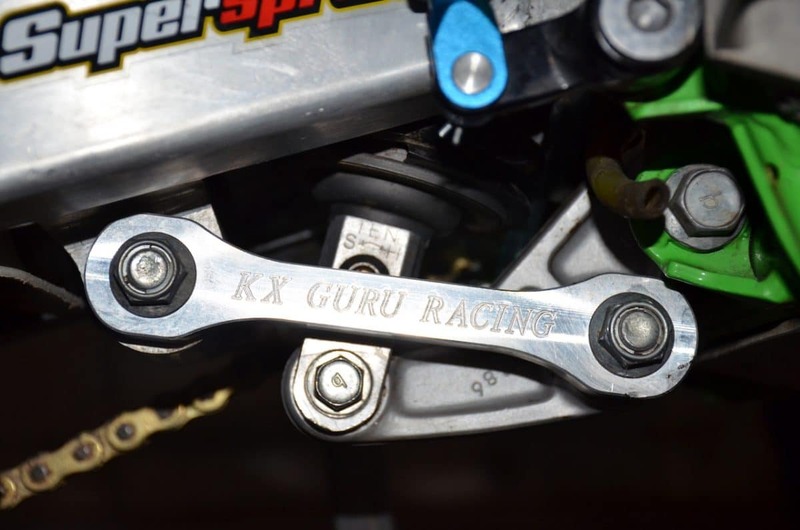 The KX Guru linkage is slightly shorter than the stock version and Alex says it improves handling dramatically. If you look close at the head you can see a decompression release mod done by Tom Morgan. The cylinder was repaired and ported by Millennium Technologies feed by a Keihin Air stryker 38mm carb through VForce 2 reeds. 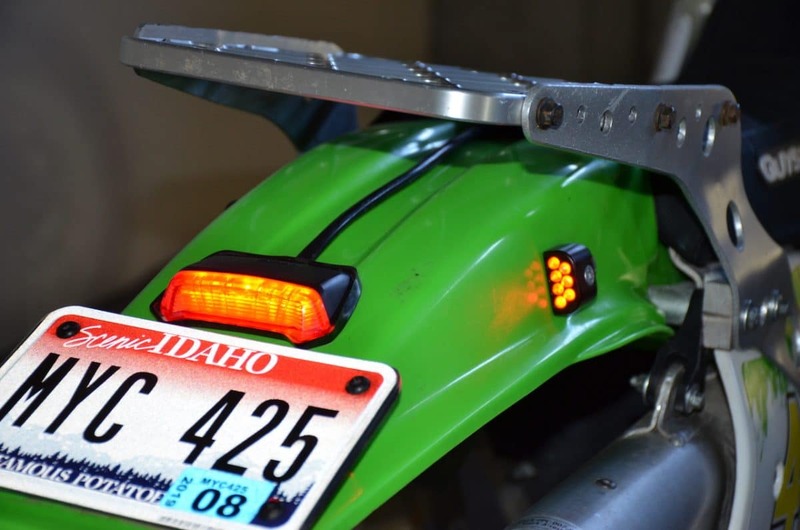 The turn signals are LED made out of aluminum by Highway Dirtbikes and the taillight is from DRC Products. 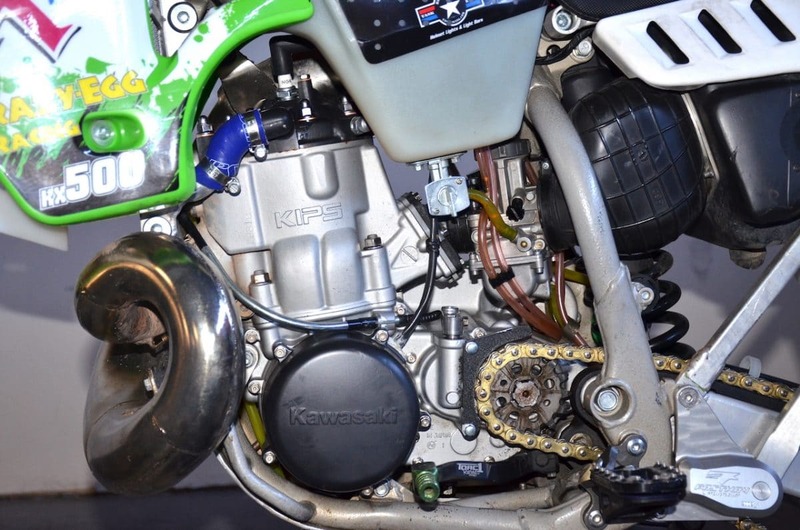 Just looking from the outside you see a KX450 rear brake pedal upgrade, Pro Circuit pipe, two piece clutch cover upgrade, Team Green water-pump frame guard modification and a TSR kips cover but the real upgrades are inside! A custom 5th gear was installed lowering the cruising speed RPMs and adding about 20 MPH on top speed. The entire transmission was WPC treated to reduce friction . 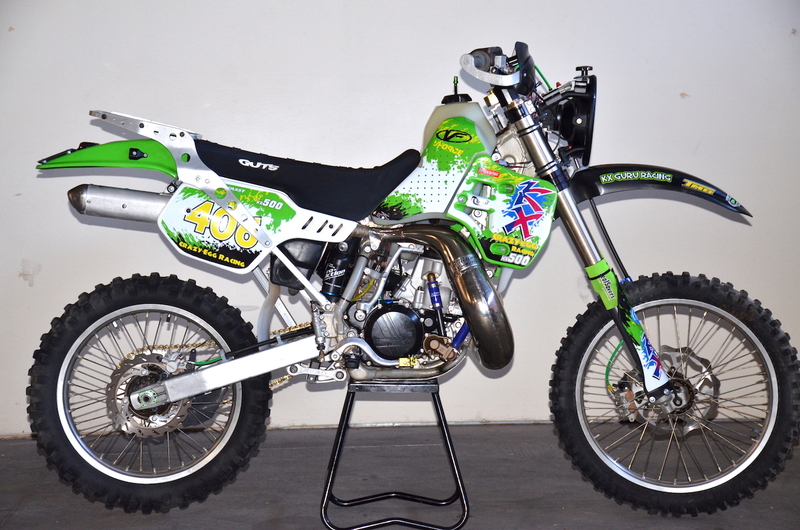 For Kawasaki faithful that always dreamed about a street legal version of the mighty KX500 here it is! Alex Ward has produced a template for you to follow that won’t disappoint. We can’t wait to spend some time in the saddle. Each pack contains two different cable diameters six and a half feet long with an assortment of cable ends for throttle, brakes and clutch applications in a compact carrying case. The Funnelweb air filters feature an open cell polyurethane foam with pyramid shaping to almost double the surface area compared to a conventional foam filter and has injection molded seals for a leak proof fit. 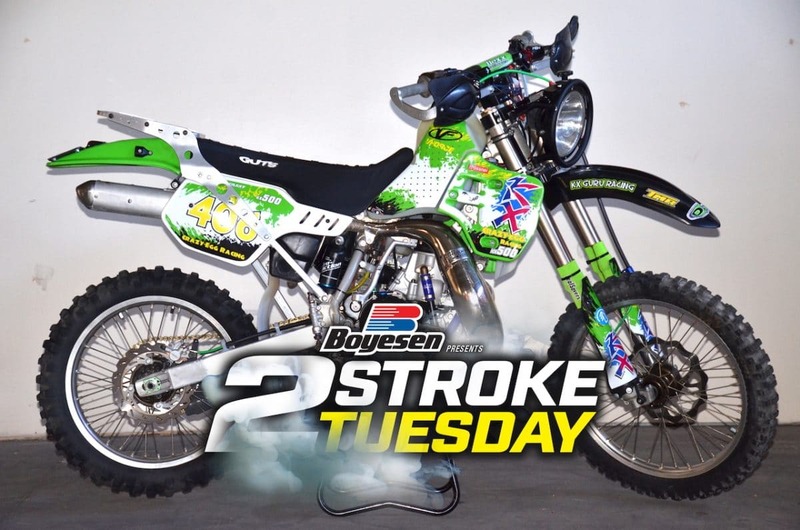 If you like the big-bore Kawasaki featured of this week’s Two-Stroke Tuesday check out this insane KX500 built by legendary fabricator Wayne Ransom . Click the image below for more!